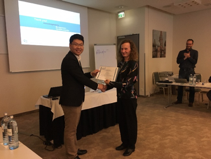 During the 133rd EuroSDR Board of Delegates meeting in Berlin, on 15 November, ITC researcher Dr. Mengmeng Li received the 3rd EuroSDR Best PhD thesis award. The award was presented by Ing. Dr. Markéta Potlûčková, Chair of Commission 6 "Knowledge Transfer" of EuroSDR. Dr. Mengmeng Li performed his doctoral research at the department of Earth Observation Science of the Faculty of Geo-information Science and Earth Observation. This resulted in his doctoral thesis “Urban land use extraction from very high resolution remote sensing images”, which he defended on April 5, 2017. His thesis supervisors were Prof. Alfred Stein and Dr. ir. Wietske Bijker. Mengmeng Li’s research focused on an old problem: extracting land use information from remote sensing images is not simple. The key issue is that land use information (the purpose for which is a piece of land used) is typically different from land cover information (what covers the ground). The latter is much easier to extract. He faced the challenge with modern images (less than 0.5 m resolution), starting with images from Wuhan, in China, where he matched his approach to an existing land use classification system. He used shadows and orientations and extracted buildings and roads as the key elements of urban land use. He distinguished factory type buildings, commercial buildings and apartment type buildings. And he went on to classify whole blocks. But most interestingly, he developed a tool that is generally usable. It consists of the binary partition tree, in which he has creatively included Bayesian and object-based elements. When this all worked out nicely in Wuhan, he addressed similar data from the other side of the world: Oklahoma City, where the types of land use are different from the Chinese, and for sure the classification system is different. The methodology worked well and he was even able to include publicly accessible information into the modeling. That is most likely a step forward, as such information is abundant. But it is not always (often not) of the highest quality, i.e. suited for its use. There are miles to go in this domain, as the next steps could be quantifying the quality and even going into land use extraction from other urban or semi-urban environments. EuroSDR (formerly OEEPE, established in 1953) is a pan-European organization linking national mapping and cadastral agencies with research institutes and universities for the purpose of applied research, and securing timely, research-based knowledge in Europe. 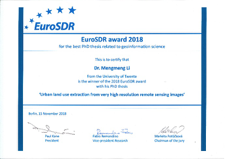 Since 2016, EuroSDR has recognised contemporary PhD theses that have significantly contributed to the development of geoinformation science in the context of national mapping and cadastral agencies (http://www.eurosdr.net/news/2018-eurosdr-award-best-phd-thesis-related-geoinformation-science). The EuroSDR PhD award consists of a certificate, a sum of 500 EUR and the invitation to present the work during the EuroSDR Board of Delegates meeting.